with healthy, loving, happy Maltipoo Puppies. 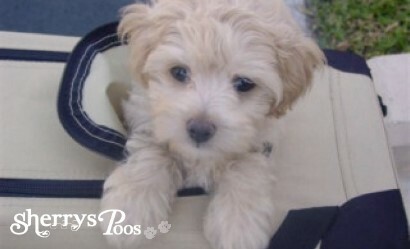 Find your new adorable puppy here at Sherry's Poos we offer adorable Loveable and Cuddly Maltipoo, Yorkiepoos and Cockapoo Puppies for families looking for a friendly and sociable puppy. They start interacting with us very early in age about three weeks old they start giving us puppy kisses and waggin their little tails. 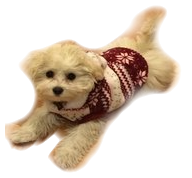 Maltipoos, Yorkiepoos and Cockapoos are very sweet and lovable they have great personalities that make them very special they love attention, extremely smart, learn quick and easy to train. Maltipoos, Yorkiepoos and Cockapoos adapt well to seniors, single people, kids and families and also smaller living spaces they make a great travel companion. Our goal is to raise and help you find a healthy, happy, loving, smart and well socialized Puppy for families looking for a wonderful lovable affectionate family pet. 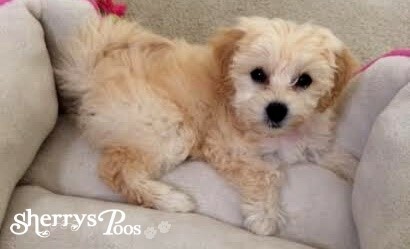 Please check out our available puppies page to see if we have any Maltipoos, Yorkiepoos or Cockapoo Puppies For Sale. We raise several designer dogs. We sell beautiful Designer Maltipoos, Yorkiepoos and Designer Cockapoos. 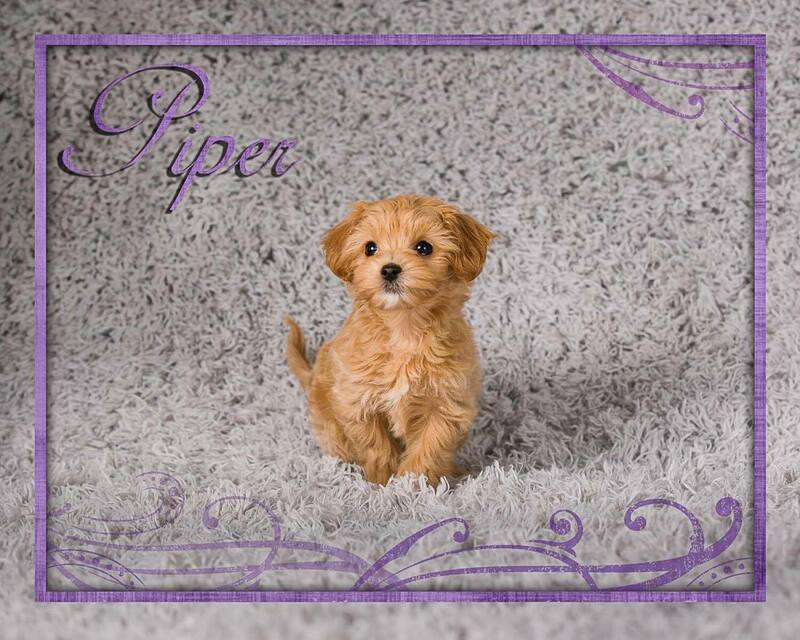 We specialize in 1st generation Maltipoos which is a Maltese and Poodle mix and our 1st generation yorkiepoos which is a yorkieshire and a poodle mix. Either one of these designer dogs a Maltipoo, Yorkiepoo or Cockapoo would be a good choice for people that have allergies and would make you a great family pet. Our puppies are raised in our home under foot where they get the best possible care and we work closely with our vet to insure that all puppies are in excellent health to the best of our knowledge.We have Maltipoos in a variety of colors Red, Apricot, Black, Black and White, Cafe au Lait, Brown, Bronze, Cream, Gray, Silver, Silver Beige, Phantom and traditional White Maltipoos. 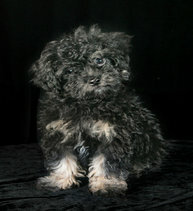 Looking for a Maltipoo? We have a great selection of Maltipoos for adoption throughout the year so you can purchase one of our cute Maltipoos today to be your companion for life. We sell first generation Maltipoos with champion bloodlines. If you are looking for a Maltipoo they make wonderful little lap dogs and love to cuddle for hours and will still your heart. They have the cutest little teddy bear face just adorable little puppies. When you purchase a Puppy from us your new puppy will come to you being Crate Trained, Potty Training Started, Dew Claws will be removed by our veterinarian, Veterinarian Health Check at 6 weeks of age and their first set of puppy shots given, will provide Medical Records from our veterinarian, Health Guarantee and Age Appropriate Worming. You will be very happy with one of our sweet and cuddly little poos, they will still your heart. Purchase a Puppy today or from one of our up coming litters to be your companion for life. Your puppy is raised in a clean, comfortable, loving and nurturing home where they get plenty of love and attention. They are spoiled from the time they are born until they go home with you. We are proud of each and every one of our puppies. We thank you for visiting us and considering one of our adorable babies. Please take the time to browse our website, which is full of information, but if you find you still have questions, please contact us. We're always available to help. Feel free to inquire about the puppies or if you have any questions please e-mail us at sherrysmaltipoos@windstream.net or call Amanda at 229-457-4658. We've discovered that there are many different ways to spell Maltipoo! We've found it written Malte-poo, Malti-poo, Maltepoo, MaltiPoo, Multipoo, Maltapoo, Multapoo, Multi-poo, Maltepoo and of course, Maltipoo, but they are all the same breed. Feature Photo For The Month!! Feature Puppy For The Week!! Kaia is our featured dog for the month. She has been an absolute angel and incredibly smart! 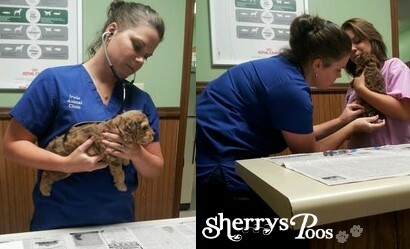 Here at Sherry's Maltipoos we work closely with our vet to insure that all puppies are in excellent health to the best of our knowledge.